Canvas teacher carry-all tote bag. Personalized teacher tote bag with whimsical sentiments... "Teacher, one who inspires, guides, enlightens and motivates", "A+ leader, motivator, role model" or "It takes a big heart to shape little minds". 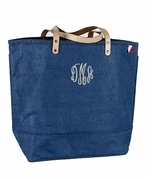 All threes totes are available to monogram the teacher's name. Heavyweight tote bag with over the shoulder double handles. Nicely sized carry-all for last minute items as teach heads out the door. Add a matching accessory pouch search item MP-4023001. The personalized teacher carry-all tote bag measures 15" x 14.5". Open top.